Wider use of available best practices and technologies could help reduce greenhouse gas emissions from the livestock sector by as much as 30 per cent, according to a new study released today by the United Nations Food and Agriculture Organization (FAO). The report, “Tackling climate change through livestock: A global assessment of emissions and mitigation opportunities,” represents the most comprehensive estimate to date of livestock’s contribution to global warming, as well as the sector’s potential to help tackle the problem. 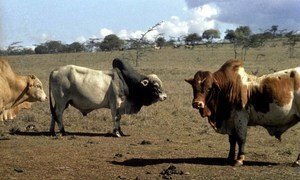 “The potential for achieving emissions reductions lies in enabling all livestock producers to change to practices already being used by the most efficient operators,” FAO stated in a news release. According to the agency, greenhouse gas (GHG) emissions associated with livestock supply chains add up to 7.1 gigatonnes (GT) of carbon dioxide equivalent (CO2-eq) per year – or 14.5 per cent of all human-caused GHG releases. The main sources of emissions are: feed production and processing (45 per cent of the total), outputs of GHG during digestion by cows (39 per cent), and manure decomposition (10 per cent). The remainder is attributable to the processing and transportation of animal products, the agency stated in a news release. It went on to say that wider adoption of existing best practices and technologies in feeding, health and husbandry, and manure management – as well as greater use of currently under-utilized technologies such as biogas generators and energy-saving devices – could help the global livestock sector cut its outputs by becoming more efficient and reducing energy waste. “These new findings show that the potential to improve the sector’s environmental performance is significant – and that realizing that potential is indeed do-able,” said Ren Wang, FAO Assistant Director-General for Agriculture and Consumer Protection. He added that it is imperative that the sector begin working now to achieve these reductions, given the strong growth in demand for livestock products in almost all developing countries, so as to help offset the increases in overall emissions that future growth in livestock production will entail. FAO noted that many of its recommendations for improving efficiency and reducing greenhouse gas emissions would also boost production – providing people with more food and higher incomes, with benefits for food security and poverty reduction. The agency added that any effort to put the livestock sector on a different path will require a broad-based and inclusive effort. “Only by involving all stakeholders – the private and public sector, civil society research and academia and international organizations – will we be able to implement solutions that address the livestock sector’s diversity and complexity,” said Mr. Wang. The Agenda targets three priority areas where improving practices can potentially bring large gains: promoting more efficient practices, improved grassland management and better manure management. As demand for livestock increases, efficient methods to increase production will be crucial to meet global needs, a new United Nations report stresses, warning current production practices lack the necessary capabilities to provide sustainable solutions over the next few decades.